A local's list of favorite restaurants and shops in Leesburg, Virginia! An opinion . . .
By popular demand and now in MIDDLEBURG, VIRGINIA . . . KING STREET OYSTER BAR is a hit! WHO WOULD HAVE GUESSED - A CULINARY "OYSTER" EXPERIENCE - JUST LIKE A FINE WINE. The King St Oyster Bar (KSOB) is one of the newest palette-pleasing spots in downtown Middleburg not to miss! It sits prominently on the main downtown drag in a beautifully-renovated bank building. With a welcoming upbeat atmosphere, it offers a medley of fresh food, raw seafood and current spirits. Rick Allison, the owner, has dabbled in the past with seafood fare, but he has hit his mark with this second very successful Oyster Bar (and restaurant) in downtown Middleburg, Virginia. The "Oyster Bar" food is VERY GOOD and it has a tasteful "unique" style with several dishes boasting a Spanish flare. See the history below on their link. The owner has an obvious knack for seafood with an unexpected twist. Rick has brought in a culinary team that, while adding excitement to his offerings, is staying in touch with what works price-wise too. EXCELLENT FOOD and unique, current cocktails. I expect an "Oyster Bar" to taste and feel like Boston or Maine because of a childhood vibe on my mind . . . instead, you are given a nautical experience with the oyster-shucking on display for your entertainment in a vibrant, warm atmosphere that has the locals and tourists already "shucking" in! DO YOU KNOW YOUR OYSTER? Given the name "Oyster" Bar, I had inquired as to the various types of Oysters being offered because I had not dabbled much with fish/seafood varietals or differences- even though both of my parents are from Boston (Dad is a "Southie" and lived a block from the water). We grew up with all types of seafood and fish and thoroughly enjoyed all foods with the Italian side and my Dad (and his Dad) loving to cook. I was completely impressed learning that some oysters are not just saltier than others, or take on a different size or shell size and shape similar to how vegetables, fishes and meats take from their own environments, but they truly vary. One can become quite the enthusiast after looking into their differences from waterway to waterway and region to region. For example, West coast oysters, the owner shared, are smaller and sweeter . . . while East coast oysters are larger and a bit saltier and brinier, encased in shells with more shades of brown, green and white. Suggesting a special East coast large oyster with a unique blend of garlic, cheeses and a flavorful combination of spices, the delicacy wowed me once again and was $5 a pop at happy hour. Don't ask me the name as the oyster which was described and delivered to us, but it will wow your palette and this was not your average "oyster" by any means! In doing a little oyster research out of a newfound curiosity, I've learned that Eastern Oysters are great for martinis because they are a bit saltier and larger, with a smoother/flatter shell which lays well on a serving plate. West coast oysters are smaller and sweeter with more jagged shells appearing in shades of black, white, pink, green and purple. Their taste is sweeter with notes of cucumber, cut grass, watermelon and other flavors have been noted. Sound familiar? Maybe like wine notes? Exactly! Also, the West coast oyster is less salty, so it lends itself well to Asian-style dishes and they are less briny (vinegary) than the East coast oyster. Moving right along to the other important stuff . . . some of my favorite appetizers at both locations are the Blue Crab and Corn Chowder, the Columbian Ceviche (a staple each time I visit with just the right amount of tortillas to go with), and the Asian Tuna several friends order regularly. I dabbled with the crab cake sandwich (ordering no bread to savor the actual crab cake ingredients). It was delicious! Growing up in Maryland, and having a family house on the water, I love to pick crabs with family and friends. Typically, I won't usually order a crab "cake" and only enjoy the pure crab meat with BUTTER, but I am so glad I did. Enjoy lobster rolls, blue cheese chips (the bomb!) and a well-rounded menu for those not into seafood. A great way to sample many of the menu items is to visit during Happy Hour (3:00 - 6:30 pm) where both $5 specials and 1/2 price oysters, along with drink specials are offered. Two of my initial favorites stemmed from happy hour and are the Columbian Ceviche and the Crab Sliders - both had just the right amount of seafood in each dish. Some other favorites are the Calamari and the Mussels, but really everything is worth sampling. Lunch starting at 11 am and dinner are both served 7 days a week, and the menu includes everything from Filet Minot to decadent desserts, some entree-style salads, a great Burger, Lobster Mac & Cheese and many great seafood dishes in between. My daughter, a foodie well beyond her years, enjoys the Basil-Encrusted Chicken (Pasta) she just loves with pesto! She is one of my own biggest food critics and so complimentary - but as she continues to order this Pasta dish again and again at the Oyster Bar, I urge her by saying "You have to try new things - this restaurant is your Oyster"! I have now been somewhat educated on oysters and decide to try this great restaurant . . . I did, all because of a little breath of fresh air arrived at its new location King Street Oyster Bar in historic, downtown, Middleburg, VA.
You can't go wrong by making a reservation, and tell them There's Something About Mary's List sent you! Oyster photo credit to EastCoastMagazine.com and some great oyster information by Maris Callahan, she picking the brain of Chicago's Pearl Tavern owner, Matt Balikov. Thank you! You may wait or even be asked to move down and change your seat when first settling in . 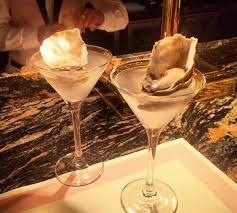 . . but don't be annoyed, the more the merrier is the Oyster Bar theme and vibe. This happening, street-facing, window-exposing restaurant is one you won't want to miss! The Oyster Bar is one of the newest palette-pleasing spots in downtown, Historic Leesburg. With an atmosphere that is lively and even loud at times, it exudes a faux water-front mindset or style in both decor and atmosphere. It has come into its own and the food is definitely worthy of its descriptive name! Rick Allison, the owner, has dabbled in the past with seafood fare, but he has hit his mark with this very successful and sought-after restaurant (and bar) on King Street in downtown Leesburg, Virginia. When first visiting the Oyster Bar with friends and co-workers (we working down the street), I tried several of the appetizers and slowly made my way through menu item . . . having a particular mind-set and how I would expect an "Oyster Bar" to taste and feel; I had a Boston or Maine vibe preconceived in my mind. After the weeks went on, and I experimented with several plates, I came to realize that this food was not only good . . . it was VERY GOOD! It ventured far from what I was used to in its tastefully "unique" style. Some dishes adorned a Spanish flare, demonstrating to me that the owner has an obvious knack for seafood with the unexpected twist. Rick has brought in a culinary team that while adding excitement to his offerings, he is staying in touch with what works price-wise and pulls in people regularly that go "out" to eat and spend their money to get what they want and will only pay for . . . EXCELLENT FOOD! Moving right along to the important stuff . . . some of my favorite appetizers are the Blue Crab and Corn Chowder, the Columbian Ceviche (yummy with just the right amount of tortillas to go with and a rarity! ), and the Asian Tuna that several friends order regularly. Recently, I dabbled with the crab cake (ordering no bread to savor the actual crab cake ingredients). Growing up in Maryland, I loved to pick crabs with family and friends we caught ourselves, this was a curiosity and typically I won't usually order a crab "cake" enjoying just the pure crab with ALWAYS BUTTER. It was not the largest crab cake I've ever had (without the bread keep in mind), but the friendly server was kind enough to include and add a side of delightful green beans which quantity-wise then passed my taste test and it was delicious. A great way to sample many of the menu items is to visit during Happy Hour (3:00 - 6:30 pm) where both $5 specials and 1/2 price oysters, along with drink specials are offered. Two of my initial favorites stemmed from happy hour and are the Columbian Ceviche and the Crab Sliders - both had just the right amount of seafood in each dish. Some other's favorites are the Calamari and the Mussels, but really everything is worth sampling. Lunch starting at 11 am and dinner are served 7 days a week, and the menu includes everything from Filet Minot to decadent desserts with some entree-style salads, a great Burger, Lobster Mac & Cheese and many seafood dishes in between. My daughter, a foodie well beyond her food years, enjoyed a Basil-Encrusted Chicken (Pasta) that she just loved with pesto! I have to share that she is one of my own biggest food critics and compliments when I cook "Italian" - she continues to order this great Pasta dish again and again. Because she loves food so much, she tries never to be disappointed. She's already realizing that when you try more out, you learn more about what flavors work best together and it opens up your palette. As she's grown more of a love for food, she tries to make a dish herself at home and change it up or experiment . . . to enjoy the process and and to have some culinary fun. SO . . . DO YOU KNOW YOUR OYSTER? Given the name "Oyster" Bar, I recently inquired as to the various types of Oysters being offered because I had not dabbled much with fish/seafood varietals or differences- even though both of my parents are from Boston (dad is a "Southie" and lived a block from the water). We grew up with all types of seafood and fish and thoroughly enjoyed all foods with the Italian side and my dad (and his dad) loving to cook. I was completely impressed learning that some oysters are not just saltier than others or take on a different size or shell size and shape (similar to how vegetables, fishes and meats take from their environments), but they truly vary to a point where one can become quite the enthusiast after looking into their differences from waterway to waterway and region to region. 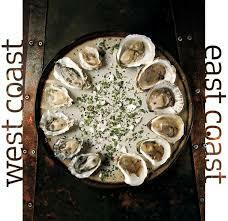 For example, West coast oysters, the owner shared, are smaller and sweeter . . . while East coast oysters are larger and a bit saltier and brinier, encased in shells with more shades of brown, green and white. Tah Dah! I have now been somewhat educated on oysters and want to venture more, all because of a little breath of fresh air in a new restaurant called King Street Oyster Bar" in the downtown, Historic District of Leesburg, VA.
Visit and make a reservation even better, but tell them There's Something About Mary's List sent you! LIVE EARLIER TODAY on Good Morning Washington . . . THE WINE KITCHEN IN LEESBURG - Eat, drink and be educated! "Good Morning Washington" on local Channel 9 (WUSA) visited the WINE KITCHEN in Leesburg, VA today! The Wine Kitchen, whose motto is "Eat, Drink, Simply" has gotten it right. They are filled to capacity every night for dinner . . . their staff has grown and is always extremely educated and friendly. 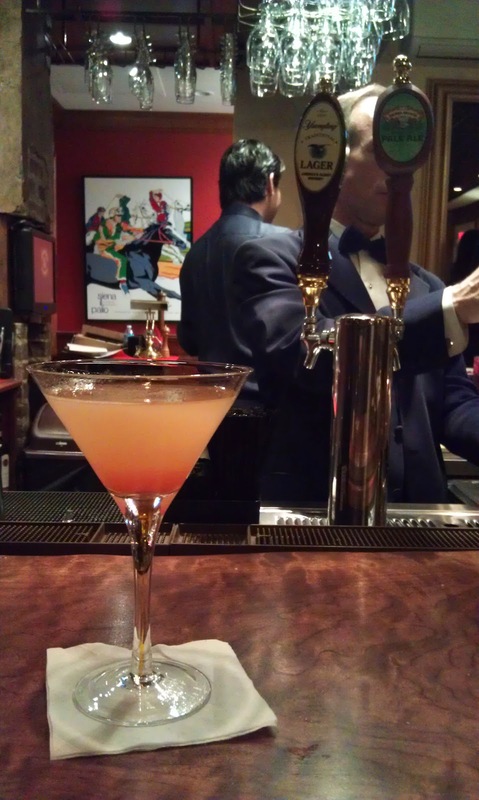 With a more recent Happy Hour Menu , they offer samples of delectable morsels in a much more light-hearted fashion while still presenting their always inviting DC-style atmosphere. The Wine Kitchen's great vibe brings me in to one of my all-time favorite American Bistros time-after-time. The Executive Chef, Tim Rowley, is a prized possession at the Wine Kitchen and his style and relaxed demeanor add to the enjoyment of the dining experience. He listens to his patrons if they have something to share and is available. The local meats, produce and cheeses that he incorporates into his diverse menu, equally mirror this very "real" yet relaxed and palette-discriminating food style. It is food you can feel good about eating, simply. NOTE: The Wine Kitchen currently donates a portion of all our weekday lunch proceeds to Loudoun Free Clinic to help in their mission to support health care services for Loudoun County residents who would otherwise do without. As originally posted, I try to visit every new restaurant in the area, and the Wine Kitchen is no exception. Not only is their food and wine selection superb, but they have a willingness to educate us and add a bit of "social" to our dining experience. I think you will just love The Wine Kitchen that has paired with local farms and others to impress your palette. The décor in Leesburg reminds me of a DC restaurant. Their style though is quite unique in that they not only serve you food and wine, but you are adorned with a "descriptive wine card" paired with each glass of wine that you order. I love this concept because it's both educational and social. Whether you are ordering food or wine by the glass (prices vary and are very competitive) or you are partaking in one of their "Flights," they add a unique touch by serving you one of their Wine Cards. It adds to your dining experience as you try to decipher from your own glass of wine whatever flavors they have poetically described on this little card. I think you will enjoy this fun, learning experience and walk away with one of those little wine cards as a special souvenir from a very special restaurant. It's a great concept. Each day they have a selection of wonderful cheeses they present on their blackboard and under "Cheese and Charcuterie" offering three artisanal cheeses for $13 or a Charcuterie Plate for $12. This is one of my favorite menu items, being Italian and enjoying worldly cheeses and platters of this type. 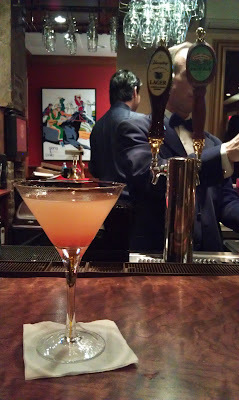 If you want to get a glimpse before dining, they have more than one location but the Dinner Menu noting happy hour morsels in Leesburg is wonderful. When it comes to their wines, it goes without saying that their name says it all! The fact that they offer numerous non-domestic wines too from all around the world, I very much appreciate. For several years now, I have given up on US wines (unless they are produced by a local, small vineyard) because they did not agree with my head, and I learned this stems from possibly the pesticides used or added preservatives for a long-term shelf life. I have no worry at the Wine Kitchen, regardless, and with plenty of wine varietals to choose from and the obvious success of this restaurant today, others should mirror the concept. What also makes the Wine Kitchen so unique, is the offering of a smaller size portion of plated food (smaller plates). They are certainly hearty enough, and I find them to be the ideal portion. The Wine Kitchen in Leesburg was one of the first to offer what I deem "gourmet" food in a lighter quantity and at a reasonable price. The best part of this concept for me, I do not go home stuffed and feeling like I spent a fortune on dinner and a glass of wine. Nor do I feel guilty not able to finish and having to bring home food I did not need to pay for in the first place. The small plate concept is smart amidst a Town filled with busy, working locals, tourists on a budget venturing out, and simply people that like to go out to eat without spending a fortune . . . the Wine Kitchen has gotten it right, in my opinion, and they are filled to capacity every night for dinner because they have. Because I originally wasn't keen on a few aesthetics of the restaurant (when they first opened up), I didn't feel compelled to return over and over if I was venturing out on a busy weekend night. If you arrive early for your reserved table or you do not have a reservation for even one of their bar stools, you have to find a comfortable place to wait and it's not easy. Their bar is not your typical restaurant bar, so it's too awkward to stand behind it because of those having dinner. This leaves you in an open area amidst on-looking tables of diners and no comfortable place to lean and wait . . . this has been my only criticism of this beautiful restaurant to date. The Wine Kitchen is a hot spot in Leesburg and you need to wait it out - your table, the food and the wine are all well worth it and your experience will hopefully be FABULOUS. Live and play in Leesburg - view a beautiful (historic) home for sale in downtown Leesburg! See one of the most beautiful examples of a historic home (built in 1780) in downtown Leesburg and only steps away from all of the wonderful restaurants, shops and businesses I love to talk about and voice my opinion on this Blog. You can also find my blog on my Realtor web site with McEnearney Associates in Leesburg VA. So sad to have seen this local hot spot go . . . hopefully your restaurant will show up somewhere very soon, Yovanna!! We miss you . . .
CHIMOLE Tapas Bar & Restaurant - Unique, delicious Honduran Food, ART and DANCING! If you have not been to the newest, happening restaurant and bar on King Street in the Historic District of Leesburg, you are missing out! Filled with such "energy," the live music and style of this special restaurant causes one to pause and ask "AM I IN LEESBURG?" We are lucky to have it. The food is excellent, and after going through some growing pains very early on due to the "instant" attraction of locals to this very festive restaurant, you won't be disappointed and should try it again if you have not been recently. The food is homemade by the owner who buys the best ingredients, and I can attest to this having bumped into her grocery shopping! Yovanna has a warm and welcoming personality that adds just that extra touch to make you want to come back time after time. She has music often . . . but on Friday nights (yes they're back!) it's one of my favorites (Toto Rivera & Alex) who bring energy to the evening with American/Latin live music. The dancing begins after 8:30 pm or so with live music and ends with even those who claim to have "two left feet" dancing in the aisles. Enjoy dinner and music or pop by after dinner elsewhere and unwind. One of my favorite attractions of this cozy restaurant and bar is the international artwork adorning the adjoining gallery walls, also a part of Chimole. Take a stroll with a glass of Jovanna's wonderful wine offerings and fall in love with a piece or two and bring it home. I did! To get a glimpse of the atmosphere, Take a peek and tell Yovanna that Mary sent you! The uniqueness of this restaurant and wine bar does not stop at your musical and visual senses, the wine selections are meaningful and well-priced. One of my favorites is a Tempranillo blend, and I am very particular about my wines. She offers organics as well. Do not miss out on this classy, warm restaurant that now has an outdoor area for the warmer months and a fire going for those daring souls who enjoy the outdoors all year round. The back patio will grow and have a bit more work done in time, but I for one will be frequenting it. The New Lounge at Palio Ristorante Italiano - Revised in February 2015! The Friday before Thanksgiving, a couple friends and I stopped by the new lounge at Palio in downtown Historic Leesburg. I need to share . . . it is truly gorgeous. The exquisite tile floors glisten, the chandelier sparkles, and the unique custom wood bar beckons you to sit and stay awhile. The owner, Michael O’Connor, has really outdone himself and proves why he is a strong advocate for bringing good food and atmosphere to Leesburg. And of course, what would a trip to Palio be without the food? 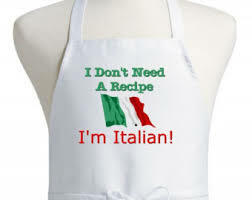 A cook, and half Italian myself, I know good Italian food when I taste it. Palio has gone through a few Chefs, and after a few recent visits, their food was delicious and the menu much more diverse. During a past visit, we tried the delicious Squash Soup which was rich, creamy and could have been a meal in and of itself. We also had the Buffalo Mozzarella, and I mean the REAL deal. It is luscious, melt-in-your-mouth goodness served on a bed of delicious greens and beautifully presented. The portion was plentiful, and you haven’t had real Italian Mozzarella until you’ve tried this. It reminded me of Italy. Next we had the Calamari, served with a home made marinara sauce. Calamari can easily be overcooked to the point of chewiness, but at Palio is comes out tender and just right. All in all, it was a great night in just the kind of friendly, yet upscale, lounge atmosphere that Leesburg has so badly needed. Be sure to stop by the next time you are out on the town! This family-owned nail salon is by far the best in town. Paul and his wife treat their customers like gold. They are obvious veterans of the business and had a salon in Sterling for many years before moving to Leesburg. They will get to know you and remember your name. My daughter loves that they are very “detailed” and do great designs that match her nail color really well! Not only is the service excellent, it is very reasonably priced - $40 for a mani/pedi that comes with paraffin wax. Personally, I think it’s the best pedi massage I’ve had. The environment is also very relaxing, with soothing music playing in the background. Plus they allow you to relax as you want while sitting in the pedi chair. This is not just a nail salon either - they also cut hair, do waxing and more. Most importantly, it is extremely clean and overall top notch. What is your favorite newer restaurant in or near Leesburg, VA? Copyright Mary Dionisio Roberge 2009 - 2015. Travel theme. Theme images by caracterdesign. Powered by Blogger.